These magical creatures have mesmerised humans for centuries and the magical world of fairies and elves offers inspiration to children and adults of all cultures. Magical creatures have been the basis of movies, art and books, giving pleasure to all as tales are passed down from generation to generation. Fairy and elf energy can still be called upon, bringing into your life endless possibilities, opening the doorway between the fairy, elf and human realm. Fairies are found in the mortal world, at times in people’s homes, near lakes and trees in the forest, mostly fairies reside in the fairy realm. Elves and fairies have supernatural powers, allowing them to move through space and change their shape into any form they choose and while in the fairy realm, elves and fairies are immortal. The fairy realm is also referred to as Avalon, the Land of the Blessed Tir-na-n-Og (country of the young) and the Otherworld. The difference between elves, fairies and humans, is that humans gain meaning within the material and physical world. Elfin and fairy energy is rooted in the Otherworld, over the centuries the worlds have become more separate. Be assured the more fairy energy you allow into your life the more magic there will be. Created before humans, elves possess supernatural powers, they are nature spirits, usually found in forest settings and woodlands. Fairies were the ancient creatures of Ireland, they evolved into various types of fairies. Different types of fairies behave in different ways, some benevolent, others malevolent. When interacting with fairies it is important to know what kind of fairy you are dealing with. Fairies possess supernatural powers, some use their powers for good others for evil, always tread carefully when interacting with fairies as they expect to be treated with reverence. All fairies reside in the fairy realm, humans visit this realm on occasion, at times by accident, sometimes by invitation and other times by sheer determination and diligence. These nature spirits are all around you, be aware, they repay kindness with kindness and bad behaviour with bad behaviour, where elves and fairies are concerned you get what you give tenfold. 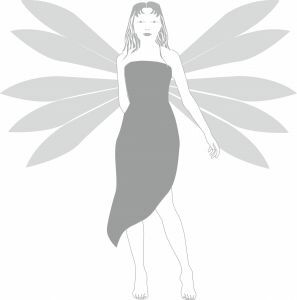 In order to draw fairy energy into your life, find your favorite place to meditate and call upon the Seven fairy Guardians, Star Finder – fairy Watcher of the east, Shining Flame – fairy Watcher of the south, Water Maker – fairy Watcher of the west, Black Mother – fairy Watcher of the north, Heaven Shiner, Fire in the Earth and Star Goddess. You can say their names out loud before you begin meditating or you can say them silently in your mind. When you meditate with these beautiful energies, you can’t help but feel uplifted when you connect with the Otherworld. If you want to connect to the fairy world, you will find the portals are at their most accessible on the eves of Beltane, Midsummer and Halloween, this is when you have the greatest opportunity to commune with these magical creatures and walk between the mortal world and the Otherworld. Go outside into the night, be near trees, plants, flowers, look at the Moon and the stars, create a mound of earth and place a spring of thyme on top and seven small crystals, the seven crystals represent the Seven fairy Guardians. Breathe deeply seven times, turn around clockwise seven times, then call the names of the Seven fairy Guardians, hold out both arms with palms facing upwards and wait for the fairy energy to fill you. There are certain fairy fragrant essences you can use in the form of essential oils, incense and candles. All elves and fairies love amber, which can also be used for psychic enhancement. Basil is for good luck, it heals wounds and promotes love and romance. Cedarwood is considered sacred and a special favorite of the forest elves and woodland fairies. Chamomile attracts fairies and a few drops on a pillowcase will ensure sweet magical dreams. Geranium oil is a special favorite of garden fairies and geranium oil is especially useful for healing and abundance. Honeysuckle is intoxicating to flower and woodland fairies, causing them to dance and sing. Before a fairy meditation, anoint yourself in geranium oil, it will draw love, romance and passion. Jasmine draws woodland elves and fairies, lavender promotes fairy dreams and heals, to ensure fairy dreams dot a little jasmine on your pillow before going to sleep. Lemon draws fruit fairies and encourages happiness, joy, fun and pleasure. Neroli can be used on your body, bedding, in your bath, in an oil burner, it draws flower and tree fairies to you. Patchouli attracts woodland elves and fairies, it enhances love and fairy encounters. Pine attracts tree fairies and forest elves, it enhances creativity, strength and love. fairies love rose essence, it attracts flower, garden and woodland elves and fairies. Use on your temples to enhance psychic abilities and light some before fairy meditation. Rose essence promotes love, heightens all senses, fosters joy and luck. Sandalwood attracts woodland elves and fairies, it enhances spiritual meditation, shape shifting and healing. Ylang-ylang, attracts flower and garden fairies and elves, it promotes passion, abundance and love. Elves and fairies are adept in the art of using herbs and essences. The fairy and elf realm is carefully hidden, yet available to humans when most needed. There are certain times of year when the veil between worlds is finer and more accessible. It is easier to communicate with fairies and elves during a full Moon, especially during Halloween. Time in the immortal world of fairies and elves is quite different to time in the mortal world. Humans visit the enchanted world and what seems like a short time to them may in actual fact be years, fairies and elves often visit the human world. Children are more likely than adults to catch sight of these glorious nature spirits. Fairy energy influences the lives of mortals, love, health wellbeing and prosperity. Everyone sees fairies at one time or another, the flash of light in the corner of your eye, the sense someone is behind you and when you turn there is no-one there or you walk into a room and feel as though someone is there. When you wake in the morning or during the night and almost see something in that momentary space between waking and sleeping. When you have a strange sensation, sometimes accompanied by a tingling up and down the spine, you can be certain you have touched upon the fairy realm. Norse mythology describes light and dark elves, the light elves lived above in the world of Alfheim, they glowed with light energy and were helpers of mortals. The dark elves (dwarves) lived in the underworld of Svartalfheim. These elves were bad tempered and did not like humans very much, they were very unfriendly to any mortals who were unlucky enough to encounter them. Light elves love the sunlight and live in the upper world, while dark elves (dwarves) live underground in the darkness. There are many varieties of elves there are woodland elves, fire elves, gray elves, green elves, blue elves, gold elves, silver elves, high elves, lowland elves, river elves, sea elves, hill elves, forest elves, blessed elves, mountain elves, wind elves and meadow elves. Elves like to live in groups, you will rarely find a solitary elf, they are very social and when the opportunity arises they will be friendly towards mortals. Elves are very protective towards nature and the Earth, and they want humans to take more care of the Earth and become more in touch with nature. 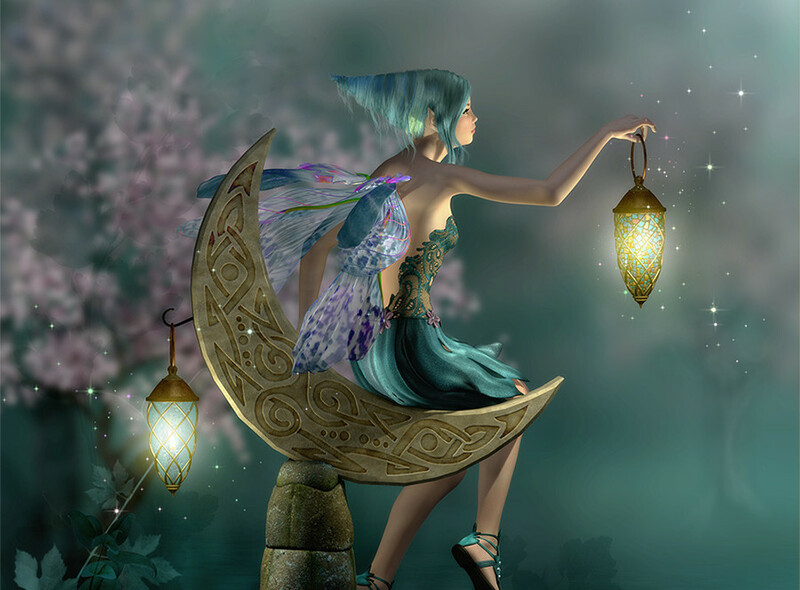 Those who believe in fairies and are on the lookout for them, will often hear the fairy music which plays through the night while the fairies dance until dawn. Just like fairies, elves can be either friendly or unfriendly, all elves are nature lovers, blending into the environment naturally becoming at one with the Earth. Elves communicate with each other telepathically, they do not age but can be hurt and killed if someone wishes them harm. Elves are quite mysterious creatures, they like to dance and can be very playful and have a certain dynamic that can draw mortals to them. Dusk is the time to see elves, you will find them in the forest at dusk, they love the Moon and celebrate when the Moon rises. fairy magic reaches us in weird and wonderful ways, treated with respect and kindness they are benevolent creatures, if treated badly they can be the most malevolent creatures. All fairies have the power to change their shape, shape shifting is a handy tool if they are being pursued or have been captured and want to escape their bonds. Because fairies are shape shifters they can appear in any form they choose, they can appear as a glowing mist or a light. Water elves appear as green and blue, while woodland fairies are green and brown, wood elves are fair skinned with dark brown hair, while the Selkies have black eyes and long blue black hair, they are very slender and shimmer silver. Some elves and fairies live in groups and are quite social, while others are solitary and prefer to be left alone. Elves and fairies are gifted illusionists, they can appear old, young, big, small, they play beautiful music and have exquisite magical singing voices that transfix the listener. They are capable of seeing through the Earth, those who live in groups travel together and Elvin or fairy groups vary in size, ranging from very large or no more than half a dozen. If an elf or fairy is angered they can be quite mean, if they witness an act of kindness they can be the most benevolent creatures on the face of the Earth. All fairies love to dance and play games, they also have a great sense of fun and can’t resist playing practical jokes on each other and on humans. Elves, trolls and dwarves are all considered part of the fairy world in modern culture, whereas ancient beliefs deemed fairies to be apart from all other creatures. There are many varieties of fairies which include, water fairies – water sprites, selkies, alvens, amnwn, sirens and nymphs. Forest fairies – corrigans, dryads, oakman and sidhe draoi. Household fairies – Billy Blin, brownies, hobgoblins, kobolds, pixies and redcaps. Brownies are a type of house elf or fairy that inhabits people’s homes, they complete unfinished jobs, look after household pets, they bring good luck to a home. A word of warning, make sure you don’t offend them or chaos will ensue, tread very carefully, they are extremely touchy, treat them with care and consideration. Dryads are earth fairies and are particularly beautiful fairies, tall and slender, they have an intricate pattern down one side of their body, representing the parent (mother tree), their hair is shaded green, brown and copper, with streaks of white and gold, it is magnificent, very long often extending to their ankles and wild. They are known as nymphs of the forest. All elves and fairies have a connection with the earth with most fairies being earth fairies. They can generally be found in the most private and remote places, glens, fruit orchids, forests, gardens, berry patches, caves, mines, rock outcroppings, fields, meadows, thickets and monoliths. Types of earth fairies are, gnomes, trows, elves, dryads, green men and women, nappees, spriggins, buccas and pillywiggins. The winged fairies are the air fairies and considered to be the messengers between the mortal and the Otherworld, they are lighter than air, they move between the mundane and the divine. Dragonflies, hummingbirds and butterflies are air fairies, eagles, owls, swans and ravens are said to be the closest birds to the fairy realm. 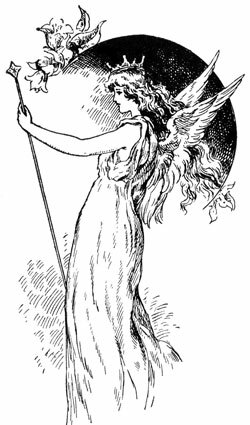 Winged fairies generally give humans a wide birth, although you can be assured of seeing one if there is a special message meant for you. Fairy wings are made of energy, light and magic, they represent ethereal forces flowing through the fairy bodies. Types of air fairies, ganconers, sylphs, ganconaughs, seelis and corrigans. Fire fairies come in two forms, the fire sprites who give off light and fire fairies, magical creatures related to dragons, they derive their magical power from the fire. They look like sparks of light travelling through the night. These fairies are not hot like fire, they are like a shining red light glowing, their light is considered divine. Types of fire fairies, salamanders, fire drakes, fire sprites, shining ones, fire feys, drakes, drachen and draks. Water fairies are called kelpies and sirens, sirens capture lovers by singing to them and drawing love towards them. Once the lover is captured they are dragged down into the depths of the ocean where they die. Water fairies often take the shape of swans, because swans are able to fly through the sky and swim in the water, they have the ability to connect the water element with the air element. Undines are known as water elven, they live in crystal palaces in the deepest lakes. Water sprites move from one world to the other and when on land shape shift into tiny red cattle with no horns. Types of water fairies, mermaids, alvens, mermen and water sprites. All fairies are shape shifters and the largest number of fairies are earth fairies, air fairies are found in the wind and the breeze, wherever there is heat and light you will find fire fairies, within rain, snow, the morning dew, any body of water and hail, you will find water fairies. By connecting with the four elements you will be able to get in touch with the different types of fairy energies and the best time to commune with fairy energy is when the veil between the mortal and fairy world is the finest, this is between dusk and dawn. Faiiries have a generally mischievous energy and love to play tricks on humans, especially if the human is greedy and places great importance on acquisitions. Fairies often take items belonging to a human and hide it away for a time, giggling as they watch the person searching for it. When a significant amount of time has gone by, they return the item to the exact place they first found it. And if someone is unkind or grumpy or treats someone unkindly, a fairy will spill something on their clothes, turn the light out when they are reading, hide their reading glasses, turn the hot water off when they are showering, hide their keys, pinch one sock or hide one shoe. Their greatest fun is had watching the frustration of a grumpy, clueless human, searching for a lost item or wondering where the mark on their clean outfit came from. How often have you found your jewellery all tangled after you left it neatly arranged, your new car battery goes flat, your wallet carefully left in your wardrobe is missing and where on earth is the remote control? If you can see the humour in these annoying instances, the fairies will warm to you and feel more kindly disposed towards you. Pixies are particularly capricious and love teasing travellers, hiding their travellers cheques, maps, suitcase keys, airline tickets, they have even been known to change hotel bookings so that when you arrive the staff are not expecting you. Have you ever taken a long drive, had a picnic and been unable to find your car keys when it is time to return home? And they find it even funnier if two people start to argue, when one is adamant they made the booking and the other person doesn’t believe them. And on those days where everything goes wrong no matter what you do, be assured a fairy is in close proximity. All fairies have a childlike energy which is why humans feel so good around them and enjoy their energy. fairies are drawn to positive loving energies and offended by unpleasant people and loud noises. All fairies are luminescent and all fairies get a kick out of teasing humans. Fairies reside happily in the Otherworld, in this place they are comfortable, safe, carefree and able to practice their magic. Gnomes prefer to live in the earth under oak trees, liking dense forests, some fairies can also be found in these habitats. The original fairies are the Sidhe, the word means hills and fairy, they lived in the hills. The dark elves are most comfortable in the lower world, living underground. The light elves are most comfortable in the upper world, while all elves and fairies are drawn to every aspect of nature. Leprechauns prefer to make their homes in abandoned burrows, hollow trees, caves with openings that are hidden by bushes and trees. Leprechauns like to inhabit places that do not draw attention to them, allowing them to blend into their environment thus remaining apart from humans. To attract elves and fairies to you, pay attention to your garden, they love flowers, plants and trees. They also love water features and fish ponds and when they are near you will have a sense of wellbeing and happiness, providing of course you treat them with kindness. They will help you to attain your personal and professional goals, maintain your health, attract abundance, awaken spiritually and have greater understanding of all there is. If you don’t treat them with the deference they expect, be assured there will be mayhem in your life, you won’t be able to do right for doing wrong and you will never find your car keys. The correct way to refer to these magical creatures is “the good folk,” or “the gentry,” they actually prefer to initiate contact with humans. They love music, celebrations, dancing, gifts and they especially like gifts of fresh food and drink. The more flowers you have planted in your garden the more likely you are to attract butterflies, hummingbirds and dragonflies, this will be a magnet for elves and fairies. Follow tradition and give your first and last piece of fruit to the elves and fairies as a gift, they like to be recognised for their efforts in controlling crops. When you leave your gifts out for the elves and fairies, speak out loud to them, letting them know you are sincere in your offering. The magical creatures absorb the essence of the food, so when you find it the next day, bury it immediately. The favorite food of elves and fairies is fresh milk, butter, fruit, vegetables, bread, cake, quality mead or brew. The best way to attract elves and fairies is to treat them with consideration and respect, give out the energy you expect to receive, positive loving energy will be reciprocated. Whether you are aware or not, the world of elves and fairies is around you, and the more tuned in you become to the possibility of elf and fairy energy the more likely you are to feel it. That little prickle on the back of your neck, the disappearing sock in the washing machine, the book you know you left on the bed. The urge to turn around because you think there is someone behind you, something you see out of the corner of your eye when you are looking in the mirror. The feeling there is someone reading over your shoulder, causing you to turn around and look just in case. The voice that whispers to you telling you that you left the tap on, or forgot to lock the front door, the urge to look under the bed just in case. The sense someone touched your hair, your cheek, your hand, the urge to open the front door because you sense someone is there. Next time this happens open your eyes, your heart, your spirit, you may find yourself face to face with a fairy.